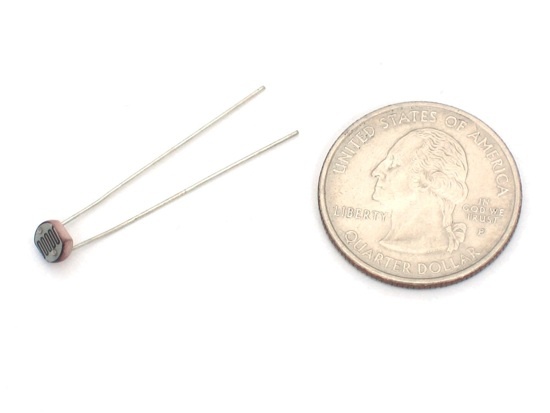 Photocells a.k.a CdS cells, photoresistors, LDR (light dependent resistor)… « Adafruit Industries – Makers, hackers, artists, designers and engineers! Photocells are sensors that allow you to detect light. They are small, inexpensive, low-power, easy to use and don’t wear out. For that reason they often appear in toys, gadgets and appliances. Theys are are often refered to a CdS cells (they are made of Cadmium-Sulfide), light-dependent resistors (LDR), and photoresistors. Photocells are basically a resistor that changes its resistive value (in ohms Ω) depending on how much. They are very low cost, easy to get in many sizes and specifications, but are very innacurate. Each photocell sensor will act a little differently than the other, even if they are from the same batch. The variations can be really large, 50% or higher! For this reason, they shouldn’t be used to try to determine precise light levels in lux or millicandela. Instead, you can expect to only be able to determine basic light changes. For most light-sentsitive applications like “is it light or dark out”, “is there something in front of the sensor (that would block light)”, “is there something interrupting a laser beam” (break-beam sensors), or “which of multiple sensors has the most light hitting it”, photocells can be a good choice! As we’ve said, a photocell’s resistance changes as the face is exposed to more light. When its dark, the sensor looks like an large resistor up to 10MΩ, as the light level increases, the resistance goes down. 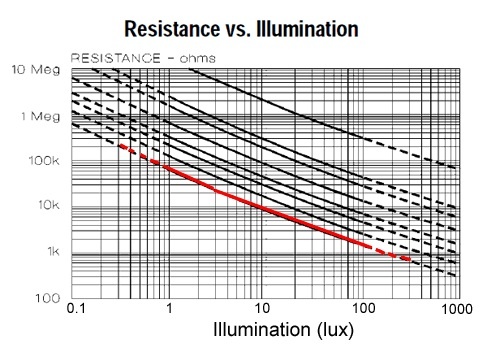 This graph indicates approximately the resistance of the sensor at different light levels. 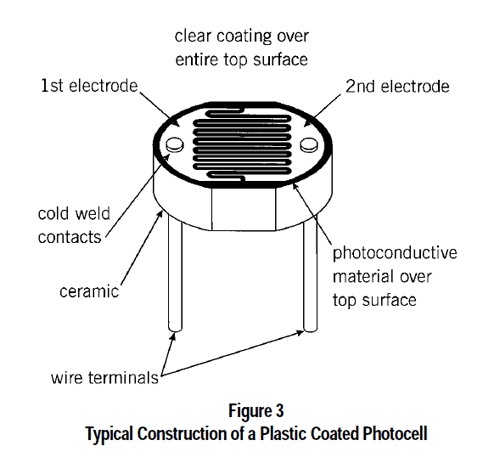 Remember each photocell will be a little different so use this as a guide only! Read more of the tutorial here… Photocells a.k.a CdS cells, photoresistors, LDR (light dependent resistor) and pick up some photoresistors at the Adafruit store! That is, map() works with decreasing ranges as well as increasing ones. Have an autocalibrate routine for LDRs and FSRs. It records maximum and minimum intensity and then gives the full 0-255 PWM output over the input range. The requested URL /media/sensors/PDV-P8001.pdf was not found on this server. The requested URL /media/sensors/DTS_A9950_A7060_B9060.pdf was not found on this server. Just wanted to add that the difference between the links to the datasheets in this blog vs. the links on http://www.ladyada.net/learn/sensors/cds.html page, is the domain name.